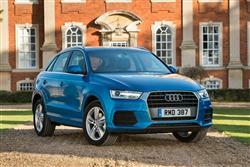 Find out everything you need to know on the new Audi Q3 from independent vehicle review website Car And Driving. You can watch the video review to the left to see more of the car or read their written review below to get a true insight from an expert in the automotive industry. With its updated Q3, Audi looks to convince us that as far as SUVs are concerned, small can be beautiful. Jonathan Crouch reports. Audi has freshened up the appeal of its Q3 premium compact SUV model with revised specifications, extra equipment and interior enhancements. As before, choose petrol or diesel, manual or S-tronic, front or four-wheel drive, with a manic 340PS RS Q3 topping the range. If there's anything we've learned in recent years, it's that underestimating Audi isn't particularly clever. Time and again, we've questioned their product philosophy and then a couple of years later we've wondered, on the back of huge sales, why we ever doubted. Here's another chance to question the Ingolstadt maker's judgement. Won't the launch of their little Q2 crossover model hurt sales of the company's only slightly larger Q3? The brand says not, but just to make sure has treated the Q3 range to an appealing wash 'n brush-up. Will it all be enough to keep this car at the forefront of the smart end of the compact five-seat Crossover sector?And is this still a cleverer, more desirable alternative to that soft roading RAV4 or CR-V-style compact SUV you might have been thinking about? Time to find out. The diesel engines soak up most Q3 customer orders but that might change if buyers were to take more notice of the 1.4-litre TFSI petrol engine with Cylinder-on-Demand technology. With 150PS on tap and the option of either manual or S tronic twin-clutch automatic transmission, it gives the exclusively front-wheel-driven Q3 1.4 TFSI a 0-62mph sprint time of just 8.9 seconds. Above it in the petrol line-up is a 2.0-litre TFSI unit, with 180PS. This unit can be linked to either manual or S tronic transmission and is exclusively fitted with quattro all-wheel-drive. The RS Q3 gets a 2.5-litre five-cylinder TFSI with 340PS that enables a 0-62mph sprint time of just 4.8 seconds. Diesel models comprise two four-cylinder TDIs with outputs of 150PS and 184PS. The 2.0-litre TDI SE with 150PS and manual transmission will record a 0-62mph time of 9.6 seconds. You can also select S tronic transmission for this model and choose between front or four wheel drive. The 184PS version also offers two transmission options, but is offered solely with quattro drive. The Audi drive select adaptive dynamics system is fitted as standard and enables the driver to make adjustments so that the driving dynamics suit personal preferences. Via four settings - 'efficiency', 'auto', 'comfort' and 'dynamic' - this set-up allows you to tweak throttle response, steering feel and (on S tronic models) gearshift timings to suit the way you want to drive. Opt for the extra cost adjustable dampers and via these settings, you can tailor the suspension set-up to the road you're on too. The styling changes made here are relatively minor but they do give the Q3 a fresher feel. Base 'Sport' models get larger front air vents and a body-coloured front diffuser. 'S line Edition' variants meanwhile, get a new look for the front end, which now incorporates a distinctive horizontal strut spanning its full width, above which are air inlets with more pronounced surrounds and a new diamond-pattern mesh design. They flank a more eyecatching Single Frame grille with a smart high gloss finish which is also shared by the air vents. If you can afford more, the 'Black Edition' variants get a meaner look courtesy of a gloss black finish for the 19-inch alloy wheels, the wheel arch cappings, the Single Frame grille surround, the roof rails, the rear spoiler and the tailpipes Otherwise, it's as you were. The revised headlights feature xenon bulbs and LED daytime running lights as standard and these are complemented at the rear by jewel-like LED tail lights. Plusher variants upgrade to all-weather LED headlights and dynamic 'scrolling' rear indicators which illuminate sequentially within two-tenths of a second from the inside out in the direction the driver intends to turn. Space inside provides room for five occupants, 420-litres of luggage space up to the parcel shelf and a maximum of 1,325-litres with all the seats folded. The seats don't tumble flat to the floor but you do get a retractable luggage cover and in top versions, there's a powered tailgate. Interior materials quality still shames every other comparable vehicle. Pricing starts at just under £27,000 and the trim line-up now runs from 'Sport' to 'S line Edition' and on to 'Black Edition'. Aside from the now range-wide satellite navigation, standard equipment for all Q3 models is plentiful and includes the Audi Music and Bluetooth interfaces, parking sensors, auto headlamps and wipers, dual-zone climate control and a Concert audio system with DAB radio linked to a 6.5-inch manually retractable colour monitor. Xenon headlamps with LED daytime running lights and LED tail lights feature as standard in 'Sport' versions, while 'S line Edition' and 'Black Edition' specification levels run to all-weather LED headlights and dynamic 'scrolling' rear indicators which illuminate sequentially within two-tenths of a second from the inside out in the direction the driver intends to turn. The 'drive select' vehicle dynamics system is standard across the range. This enables drivers to adjust throttle response, automatic transmission shift points and the operating characteristics of other optional components such as the damper control system to suit personal preferences. As before, the options list could severely dent your bank balance. How culd you not want your Q3 to come with a Bose surround sound system with 14 individual speakers, a hard-drive-based navigation system with seven-inch colour screen, mobile wi-fi hotspot capability and a parking assistant that features no fewer than 12 ultrasonic sensors to guide the car into a tight spot? The Q3 has always done well in this regard and the Cylinder-on-Demand technology for the latest 1.4-litre engine spells an almost diesel-like 50.4mpg on the combined cycle. Above it, the quite scarily potent RS Q3 can even record 32.8mpg if you don't give the turbochargers too much work to do. The 150PS diesel returns a combined figure of 61.4mpg and emissions of 119g/km. Go for an S line version with the bigger alloys and those numbers are 60.1mpg and emissions of 122g/km. Like most Audi models, once you've taken the pain of the initial asking price, ongoing costs should be manageable. As long as you don't go too berserk when choosing options, you'll have those reassuringly plump Audi residual values to fall back on, by far the biggest ticket item when it comes to overall cost of ownership in this corner of the market. Quietly and inexorably, Audi tends to develop its models until there aren't too many valid reasons for not buying them. Somewhat counter to many expectations, it's not always a manufacturer that gets things 100 per cent right straight from launch, but it listens and learns and doesn't make the same mistakes twice. The Q3 has done reasonable business for Audi but some of its rivals have shown how far it's got to go to be the sector leader. This round of improvements makes it better value and a bit sharper to look at. Boosting the amount of standard equipment on offer is a solid sales tactic and prices haven't moved a great deal, despite Audi offering a good deal more car. Is it enough to put the Q3 where Ingolstadt demands? Maybe not right away, but we wouldn't bet against it getting there in the longer haul.